Willie Meikle, What Are Some of Your Favorite Pieces of Fantasy Fiction? To celebrate Sword and Sorcery month here at Horror Delve, I wanted to find out what were some of the best pieces of fantasy fiction? To do this, I asked a great group of modern writers to list some of their favorites. First up is Willie Meikle, a prolific writer with over 20 novels and 300 short stories in a variety of different styles (including new stories featuring the likes of Sherlock Holmes and my all-time favorite occult detective Carnacki). He’s had his own series of fantasy novels published and, as you’ll see in list below, he has a real passion for the genre. Willie: I’ve tried my hand at several works of fantasy over the years, and they almost always come out the same way — pulpy, with swords, sorcery, monsters and bloody battles to the fore. It’s the way I roll. I may start with good intentions, of writing high fantasy with political intrigue and courtly goings on but, as in the Watchers series, my inner barbarian muscles to the fore, says Bugger this for a lark, and starts hacking. The blame for my enthusiasm can be laid squarely at several doors. There’s Conan, of course, and Elric, Corum, Hawkmoon and the whole pantheon of Eternal Champions; there’s Fafhrd and the Gray Mouser, Solomon Kane, Jon Shannow, the princes of Amber and the shades of a thousand more by the likes of Poul Anderson, A E Merritt, Edgar Rice Burroughs, H Rider Haggard and many others. Here’s a personal top ten. Ask me tomorrow and there might be more Amber in it, or more Elric, or even John Carter, but this is the one for today. Completely bonkers melange of lost world adventure, reincarnation, Norse Gods, faerie and pulp heroes doing what a man’s gotta do. Merritt had a wild imagination, and here he gives it full rein, and even includes a nod to the dreaming, tentacled god in the depths. Wonderful stuff. Baroque, multi-layered and demanding of concentration, here’s a proto Game of Thrones -knightly chivalry, dark deeds,threatening monsters and all. Full of strange names, archaic language and strangely compelling, sucking you into the world completely. The best double act in S&S history, and my favorite adventure of theirs. Not much to say except it’s a great read, full of wit and charm as you’d expect from one of the best genres writers of the Twentieth Century. I’ve loved this since first reading – a prime example of how a simple idea can build into a complex plot and back story, and how mythology and storytelling build the reality we live in. Coupled with the fact that Holdstock’s prose is gorgeous and full of almost poetic rhythms and you have a classic on your hands. Another wild imagination and, like Merritt, Moorcock is never afraid to throw everything and the kitchen sink into the mix. In this four book series he does just that – massive battles, courtly intrigue, high weirdness and multiverses, comedy sidekicks and proto-steampunk in his depiction of the empire of Londra. I read this when I was 14, and again recently and it sucked me in all over again. Something far quieter, far more reflective. Stewart’s Merlin is moody and introspective and very much rooted in Celtic mythology. The whole series is a fresh look at Arthurian myth with much of the chivalry stripped away, and I love it. The granddad of the genre, and still one of my favorites. I keep hoping for the chance to submit to a Conan anthology. Hopefully someday. And now for something complelely different. 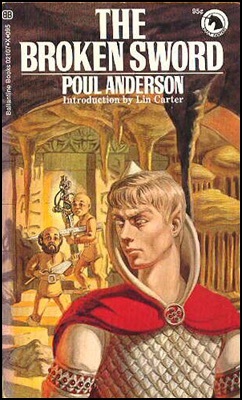 Arthurian again, but set in the UK in the years after the war in bombed out buildings and urban wastelands-a quest tale, a child’s nightmare and the one single book that molded my love of the genre way back in the ’60s even before I found The Hobbit. It’s not well known, but it bloody well should be. Still a favorite, and has been since a first read back in 1969 or so. I read it again every couple of years, and although the movies have altered the way I see it in my head now, I still find the books’ warmth and charm, and the sense of deep myth and history, to be my favorite way of consuming the Middle Earth experience. Top of the Pops is another old favorite. Moorcock recommended it in an essay in the ’70s and I sought it out. I’m very glad I did for it’s a tale of mismatched brothers, changelings, high elves and low deeds, cursed swords and mayhem. Full of doom, gloom and despair, it’s prototype grimdark, and one of the classic tales in the genre. I’ve been recommending it to people for years, and they always thank me later. On Stranger Tides – Tim Powers. Pirates, zombies, magic, derring do and swashbuckling, it’s like a weird Errol Flynn movie. Disney pinched its tropes for a reason – it’s a great, fun read, and another one I go back to regularly. I haven’t read a huge amount of fantasy either, although it’s my second favorite genre, so I’m going to pick some of these up as well. Nice to see Holdstock’s Mythago Wood getting name-checked, a magnificent novel. The sequel, Lavondyss, is even better for my money, a beautifully crafted thing. One of several on Willie’s list I’m going to have to add to my list of books to read.